Компания Coin Invest Trust для Республики Палау изготовила монету «Даниель Фаренгейт», посвященную немецкому физику и одному из его изобретений. Даниель Фаренгейт (1686–1736) – известный изобретатель. Изготовил термометр и барометр, а также первый весовой ареометр и термобарометр. Вначале термоскопической жидкостью ему служил спирт, но затем около 1715 года он заменил спирт ртутью, чем достиг гораздо большей точности измерений. Единица измерения температуры градус Фаренгейта (°F) была названа в его честь. На аверсе изображен герб Республики Палау и соответствующая надпись «REPUBLIC OF PALAU». Внизу указан номинал «5$». Реверс представляет термометр. По краю реверса расположены 10 дисков, в зависимости от наклона монеты в них проявляются цифры, обозначающие градусы. Ткже указаны год чеканки монеты «2014», факсимиле подписи Фаренгейта и его имя «DANIEL GABRIEL FAHRENHEIT». Монета 5 долларов из серебра 925-й пробы (proof), имеет вес 31,1 г, диаметр 50 мм. Тираж – 450 шт. На видео представлена монета в «действии». Категории: Видео, Новости, Новые выпуски, Нумизматика, Переводы. Daniel Gabriel Fahrenheit was born on May 24th, 1686 in Gdansk. He was a Prussian physicist and the inventor of measuring instruments. Fahrenheit was the first scientist who succeeded in creating a calibrated thermometer. It was this calibration which allowed the serial production of thermometers. The temperature unit «degrees Fahrenheit» was named after him. On September 16th, 1736 the scientist died at the age of only fifty. Working thermometer, see below for video of companion Celsius piece demonstrating how the coin works. Категории: Видео, Новости, Новые выпуски, Нумизматика. The economic hardships of the Great Depression had left Canada's military undermanned and unprepared for the onset of war, and its equipment was at risk of being outdated. Thanks to a national recruitment drive, over 58,000 men and women enlisted by the month's end. Coastal defences were reinforced, militia regiments were mobilized and the British Commonwealth Air Training Plan (BCATP) – which would eventually train nearly half of the Commonwealth's air crews on Canadian soil–was implemented. In December, units of the 1st Canadian Infantry Division set sail from Halifax to Britain–the first wave of Canadians who would serve overseas until the war's end in 1945. Meanwhile, Canada's economy adapted quickly to the war effort and transformed the country into an economic power. New industries were created while existing factories converted to the production of wartime materials. Thousands of airplanes, ships, vehicles, guns and ammunition would be produced by factories in Canada, which became the fourth largest supplier among the Allied countries. Coin presents a side-profile of a Canadian machine gun regiment during training. At left, a private is seated as he steadies a tripod-mounted Vickers machine gun, while a sergeant stands above him and directs the private's attention to a target in the distance. The obverse features the effigy of Her Majesty Queen Elizabeth II by Susanna Blunt. New from the Perth Mint of Australia is the Disney Mickey & Friends collectible coin series featuring colorful images Mickey Mouse, Minnie Mouse, Donald Duck, Goofy, Daisy Duck and Pluto. 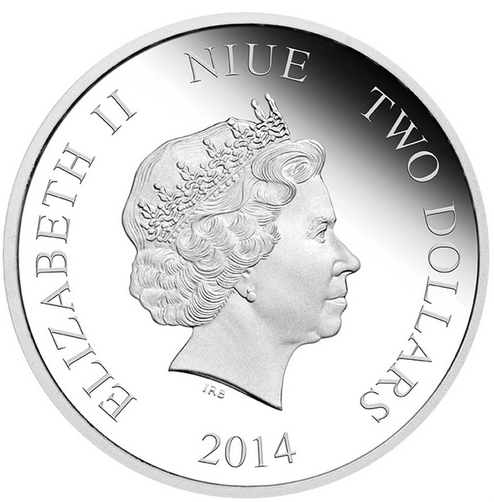 Issued as legal tender under the Pacific isle of Niue, each obverse of the coin features the Ian Rank-Broadley effigy of Her Majesty Queen Elizabeth II, the monetary denomination, and the 2014 year-date. Reverse coin designs offer an iconic image of a popular Disney character that is set against a film reel background. Inscriptions include the character’s name and "1 oz 999 Fine Silver ©Disney." Brief design information and an image of each coin follows. Showcasing the world’s favourite animated mouse, Mickey Mouse, this exceptional new coin from the Mickey & Friends series is sure to please Disney fans the world over. The Mickey coin’s reverse portrays a contemporary colour image of Mickey Mouse wearing his trademark shoes and white gloves, set against a film reel background. The design includes the inscription MICKEY MOUSE. The Perth Mint is pleased to present Walt Disney’s Minnie Mouse, the stylish, lifelong sweetheart of Mickey Mouse, on this iconic silver release. The Minnie coin’s reverse portrays a contemporary colour image of Minnie Mouse in her trademark red and white polka dot dress, set against a film reel background. The design includes the inscription MINNIE MOUSE. The loveable show-off known for his short temper, Donald Fauntleroy Duck, is one of Disney’s most beloved characters and features on this iconic silver release. The Donald coin’s reverse portrays a contemporary colour image of Donald Duck wearing his signature blue sailor suit with a bow tie, set against a film reel background. The design includes the inscription DONALD DUCK. The Perth Mint is proud to present Goofy, Disney’s extremely clumsy, although surprisingly intuitive and knowledgeable dog, on an iconic silver release. The coin’s reverse portrays a contemporary colour image of Goofy wearing a turtle neck, waistcoat, white gloves, and a tall hat originally designed as a rumpled fedora, set against a film reel background. The design includes the inscription GOOFY. Daisy Duck, one of Walt Disney’s most sophisticated cartoon characters and introduced by Disney in the 1940 short film, Mr Duck Steps Out, features on a spectacular coin release. The Daisy coin’s reverse portrays a contemporary colour image of Daisy Duck wearing her trademark blouse with puffed short sleeves, a matching hair bow, and heeled shoes, set against a film reel background. The design includes the inscription DAISY DUCK. Mickey Mouse’s cheerful and adventurous pet dog Pluto, a pioneering figure in character animation, features on an iconic silver release. The Pluto coin’s reverse portrays a contemporary colour image of Pluto, a mustard coloured dog with black ears, modelled on the English Pointer breed, set against a film reel background. The design includes the inscription PLUTO. These 2014 Disney Mickey & Friends Coins are issued by New Zealand Mint as legal tender of the Pacific Island of Niue. Each coin is individually housed in a perspex case allowing 360 degree presentation. Each coin case is surrounded by film-themed shipper illustrating the history of Mickey Mouse, Minnie Mouse, Donald Duck, Daisy Duck, Goofy or Pluto. 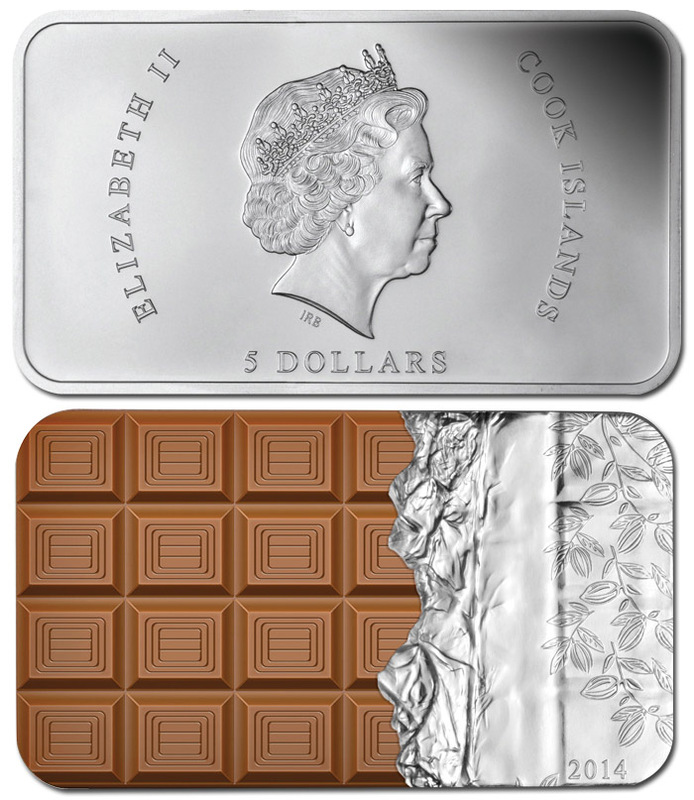 With a voracious market showing an insatiable appetite for cutting-edge collector coins, it’s no surprise that the 2014 $5 Chocolate Scented Silver BU has sparked frenzied demand. A sure-fire recipe for success, this pure silver $5 coin looks and smells like CHOCOLATE! 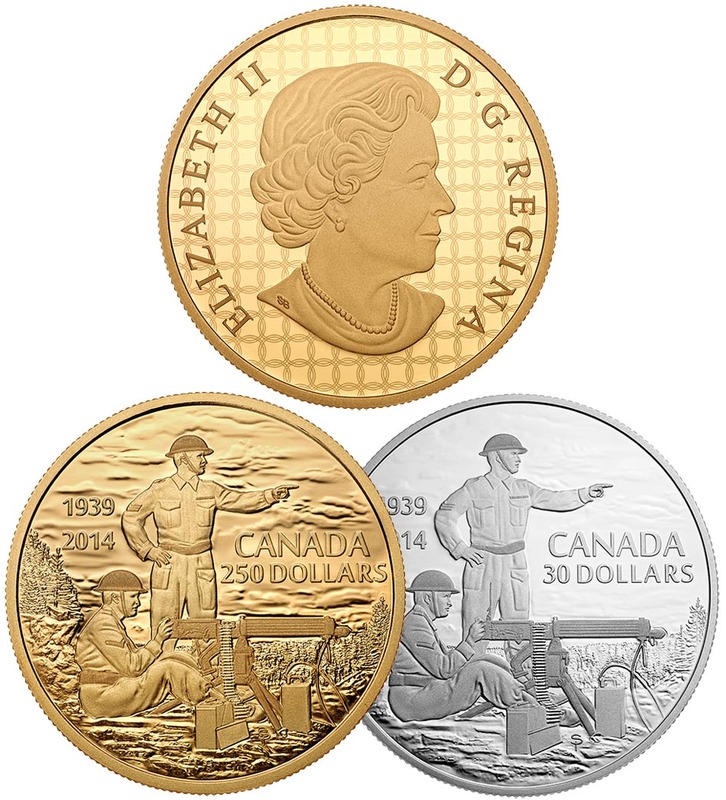 This astonishing $5 BU coin takes numismatics to a completely new world. Not only is this official legal tender $5 a perfect recreation of a chocolate block – it actually smells like chocolate! With a delicious chocolate-scented rub & sniff layer producing the aroma of the world’s favourite sweet treat, the 2014 $5 Chocolate Scented Silver BU will satisfy the hunger of anyone looking for ‘that something different’ for their collection. Монетный двор Австралии Perth Mint в апреле 2014 года выпустил ограниченным тиражом платиновый слиток с семью розовыми бриллиантами, которые добывают в Австралии. Розовые алмазы добывают на западе Австралии на шахте Аргайл (Argyle) в райoне Восточного Кимберли (East Kimberly). На шахте Аргайл добывают больше 90% всех розовых алмазов мира. На обратной стороне представлен муравейник в разрезе со вставкой из пяти розовых бриллиантов, а шестой алмаз несет муравей. 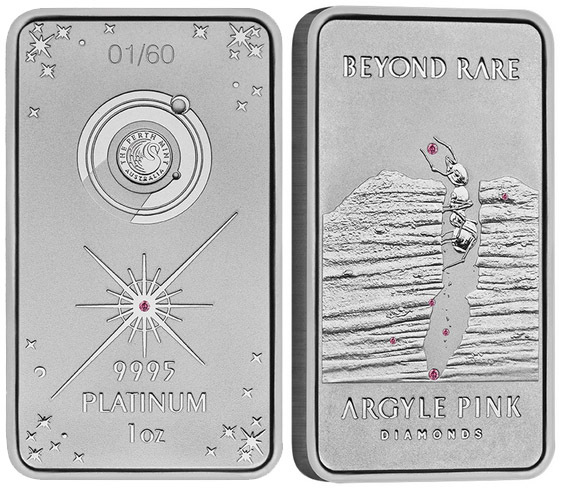 Вокруг расположены надписи: «BEYOND RARE» и «ARGYLE PINK DIAMONDS». На лицевой стороне слитка изображены звездные скопления с седьмым ослепительным розовым бриллиантом в центре. Над ним расположен логотип монетного двора Perth Mint в стилизованной планетарной сфере. Вверху выгравирован индивидуальный серийным номер каждого слитка. Платиновый слиток имеет вес 31,104 г, размеры 41,60 x 24,60 мм. Тираж — 60 шт. For more than a billion years, Mother Nature’s most precious treasure was hidden a hundred miles beneath the Earth’s surface. Over time, a hint of the exceptional bounty, the world’s rarest diamonds, was discovered glinting in an anthill. A selection of seven precious Argyle Pink Diamonds (approximately 0.11 carats), have been delicately hand set into each ingot. Polished to perfection, this exclusive investment piece depicts an anthill embedded with five Argyle Pink Diamonds, and an ant holding a sixth diamond, framed by the inscriptions BEYOND RARE and ARGYLE PINK DIAMONDS. The obverse of the ingot displays intricate star clusters with a seventh dazzling Argyle Pink Diamond in the centre surrounded by a starburst. To complete the celestial theme, The Perth Mint logo is sculptured within a stylised planetary sphere, headed by the individual serial number of each ingot. The Argyle Pink Diamond Platinum Ingot is presented in a prestigious matte black gift box with a bevelled centre window within a stylised shipper and is accompanied by a numbered Certificate of Authenticity. Монетный двор Австралии г. Перт в марте 2014 года представил монету «100-летие создания подводного флота Австралии». Королевский Австралийский Военно-Морской Флот (англ.Royal Australian Navy) — один из видов вооружённых сил Австралии. Создан в 1901 году из военно-морских сил Содружества, представлявших собой небольшие объединённые колониальные морские силы объединившихся в федеративное государство штатов. До начала Второй мировой войны основную роль по защите Австралийского Союза, Новой Зеландии и других тихоокеанских стран и территорий Британского Содружества играл Королевский военно-морской флот. На аверсе отчеканен портрет королевы Великобритании Елизаветы II работы Иена Рэнк-Бродли (Ian Rank-Broadley FRBS). По краю монеты выгравированы надписи: «ELIZABETH II», «AUSTRALIA», «1OZ 999 SILVER», «2014», «1 DOLLAR». Реверс представляет подводную лодку, готовую к погружению в океан, воды которого выполнены в цвете. Заметна подводная часть субмарины. На водой расположены эмблема австралийских подводников и знак монетного двора «P». В верхней части полукругом выгравирована надпись «CENTENARY OF AUSTRALIAN SUBMARINES 1914–2014». В левой части указаны инициалы дизайнера «WR» (Wade Robinson). Вместе с данной монетой продается и реплика значка австралийских подводников с надписью «SUBMARINE FORCE AUSTRALIA SILENT SERVICE». Монета 1 доллар из серебра 999-й пробы (proof) имеет вес 31,135 г, диаметр 40,60 мм, толщину 4 мм. Тираж — 3 000 шт. 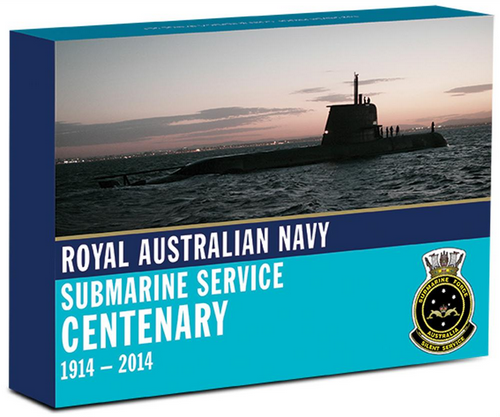 The Perth Mint is pleased to celebrate 100 years of Australian submarines with the release of this beautiful commemorative Centenary of Australian Submarines 2014 1oz Silver Proof Coin & Replica Badge Set. The reverse of the coin features a coloured representation of a submarine cruising through the ocean. The ocean is portrayed as breaking through two concentric circular rope features that are derived from the Royal Australian Navy Submarine Service ship’s badge. 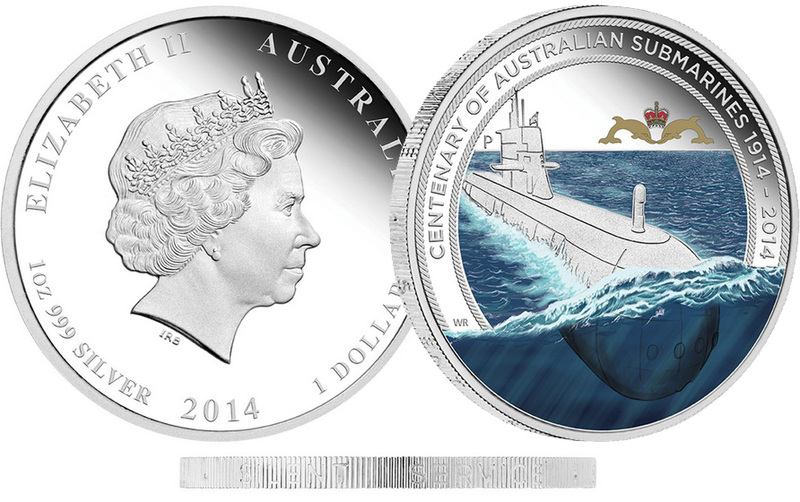 Also included are the dolphins and crown featured in the Royal Australian Navy Submarine Service badge, the inscription CENTENARY OF AUSTRALIAN SUBMARINES 1914 – 2014, and The Perth Mint’s ‘P’ mintmark. Issued as legal tender under the Australian Currency Act 1965, the Ian Rank-Broadley effigy of Her Majesty Queen Elizabeth II, the monetary denomination, the coin’s weight and fineness, and the 2014 year-date are shown on the coin’s obverse. An enamel badge replicating the official Royal Australian Navy Submarine Service badge is included in the set. The badge design features the dolphin and crown emblem and incorporates the inscription SUBMARINE FORCE AUSTRALIA SILENT SERVICE. 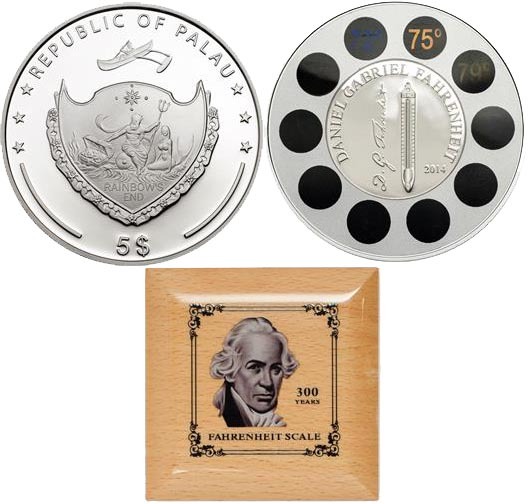 Each coin and badge set is accompanied by a numbered Certificate of Authenticity and is housed in a presentation case within a specially designed illustrated shipper reflecting the theme of the coin.